Cavechat.org • View topic - Calling all graphic artists! 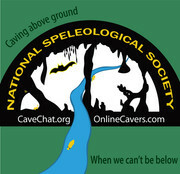 We are looking for an ad for Cavechat/Onlinecavers to run in the NSS News and possibly in the convention guidebook. If you think you have what it takes I invite you to step up and give it a shot. The ad needs to be 2.33in x 2.33in. I would like to have this ad ASAP since the selected ad will be printed in the earliest available spot in the NSS News. You can post them here if you would like or email them to me personally at admin@cavechat.org. Like I said I would like this ad to market both Cavechat.org and Onlinecavers.com in the same ad. I look forward to seeing what you all come up with. Here are a couple ads we have run in the past. Re: Calling all graphic artists! /me gets to work happily. SEE BILL, THIS IS THE SORT OF THING I CAN HELP WITH! I DO MY PART! I figured you would like the opportunity, hopefully some others will take a shot at it. Lately, it seems the ad should feature something about all the free SPAM you can handle lol. and trying the "add image to post"
Amy, I fixed it so your image is displayed. The disable BB code and disable smileys boxes were checked in your previous posts. Go to the top left of the page and click on user control panel > board preferences > edit posting defaults - and click the appropriate buttons. Same with anybody else who is having problems with BB code showing up in their posts. I think this might be another glitch from our recent software updates. NZcaver wrote: Amy, I fixed it so your image is displayed. The disable BB code and disable smileys boxes were checked in your previous posts. It only happens in this subform I do see a warning to the right that "BBCode is OFF" but that's not my setting, it's this subforum's setting. Sungura wrote: It only happens in this subform I do see a warning to the right that "BBCode is OFF" but that's not my setting, it's this subforum's setting. Amy, did you check your settings in the UCP per my instructions? From our end it appears be a user issue, not a subforum issue. Yup I double checked it just in case but it was fine. And as you've probably seen even today I"ve posted photos in other subforums just fine. It's just this one that doesn't allow smilies or bb code. Try changing your UCP settings, and changing them back again? Does your screen in the user control panel look like the screenshot below? Sorry Amy, the problem should be fixed now. Apparently the former admin Wayne had not set any user permissions for this forum except for mods and the admin. I thought everything was fine since the forum settings were correct it was just the registered users group was not configured to post in this forum.